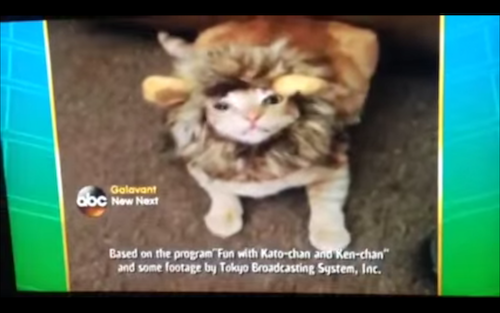 Who are Katō-chan & Ken-chan? but I'm a huge fan of Japanese band/comedy troupe The Drifters, especially their TV shows. and even picked up VHS tapes of a couple of their old movies. Comedy movies have definitely changed a lot since the 60s, but the classics still have their own special charm. starred in another variety show, "加トちゃんケンちゃんごきげんテレビ" (Katō-chan Ken-chan Gokigen Terebi - usually translated as "Fun TV With Katō & Ken"). 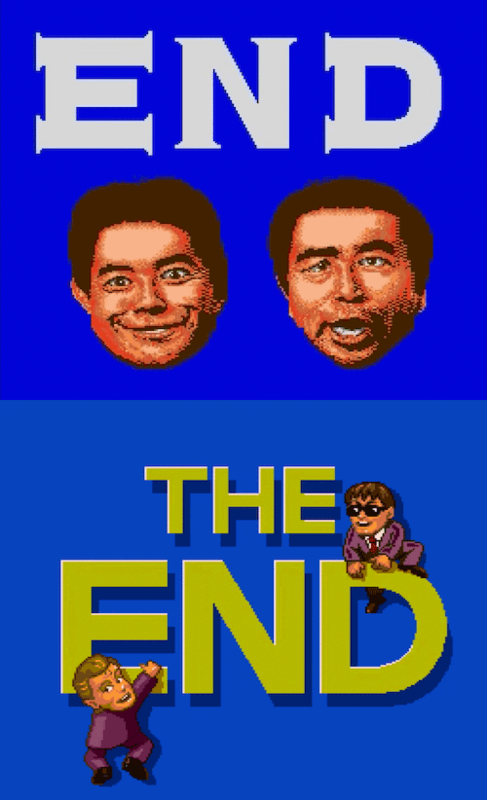 A game based on the show was made for the PC Engine (TurboGrafx-16 in the West), and even got released in America! 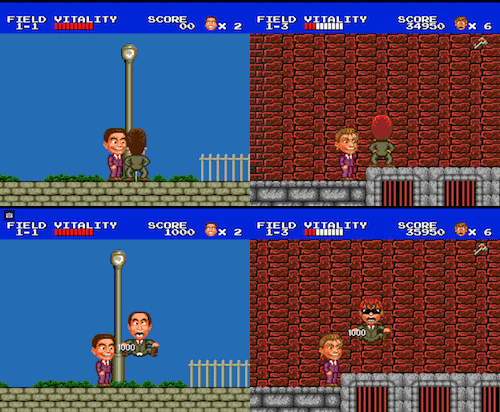 We'll be taking a look at that game this time - the Japanese version, "カトちゃんケンちゃん" (Katō-chan Ken-chan), and the American version, "J.J. & Jeff"! First of all, let's go into a little more detail about the show the game is based on. I'll just call it "Fun TV" for short. Fun TV was a variety show that aired from 1986 to 1992, with two main segments: "THE DETECTIVE STORY" and "おもしろビデオコーナー" (Omoshiro Video Corner, essentially "Interesting Video Corner"). おもしろビデオコーナー was a segment where amusing videos submitted by viewers would be aired and commented on by Katō and Shimura, with prizes going to the best ones. If that sounds familiar, it's because the segment was the direct inspiration for America's Funniest Home Videos (a show which is on the air to this day). Fun TV is actually mentioned in the credits of every episode of AFV! They apparently also still pay royalties to TBS (Tokyo Broadcasting System). "THE DETECTIVE STORY", on the other hand, was a long-form comedy/drama sketch segment featuring Shimura and Katō as detectives. Or at least, the set-up is that they're detectives, but a lot of the sketches end up being completely unrelated to detective work. 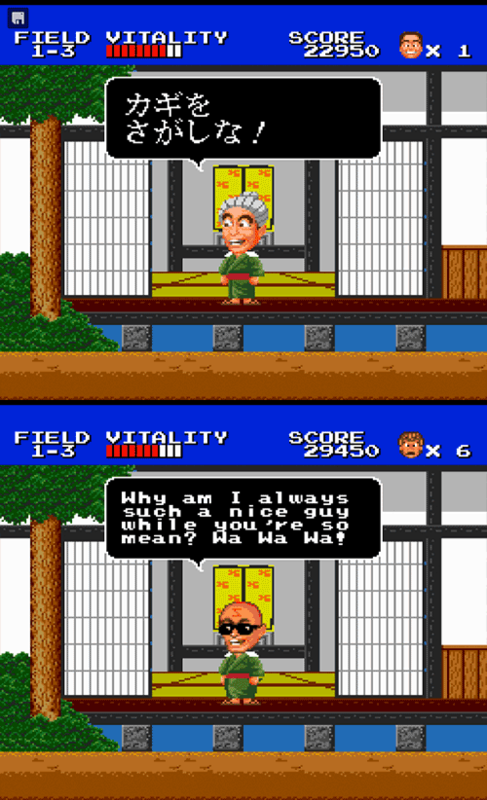 THE DETECTIVE STORY segments are what the Katō-chan Ken-chan game was based on. If you have a bit of time check out an episode, this one's enjoyable even if you don't know much Japanese. Although the おもしろビデオコーナー format got brought to America as AFV, Fun TV itself (and indeed any of The Drifters' shows) were and are all but unknown in the US. So how do you localize a game based on a show nobody's heard of? There're a few routes you can take, but with Katō-chan, they decided to go the route of changing the game to be about different characters. 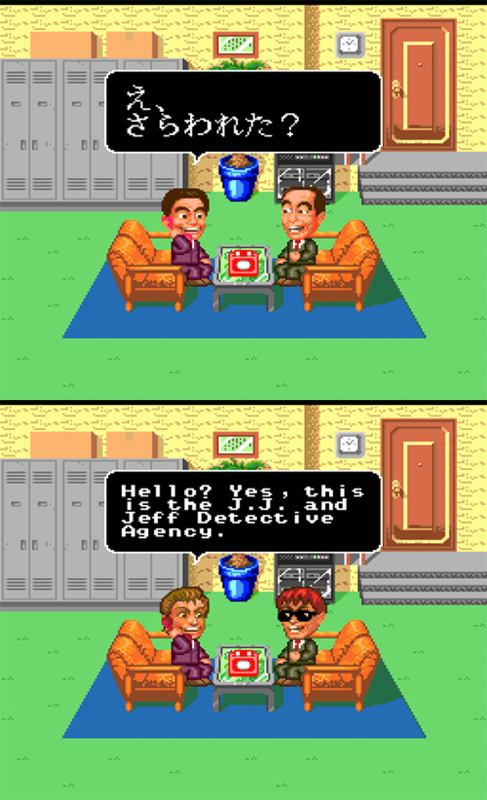 New characters created specifically for the game, in fact: J.J. & Jeff. so is there really a need to go to the trouble of changing everything? so maybe a total conversion is the best method after all. It might also be the case that they simply felt the game would sell better with Westernized characters. 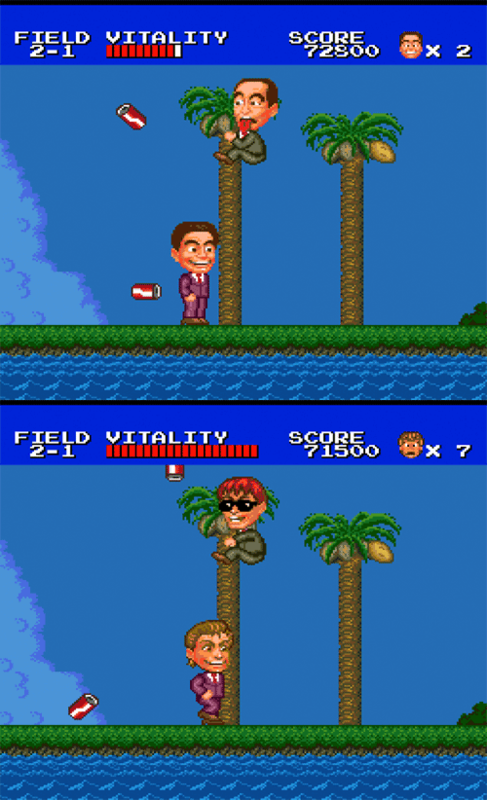 J.J. & Jeff is a side-scrolling action game, with controls similar to Hudson's Adventure Island or Sega's Wonder Boy. 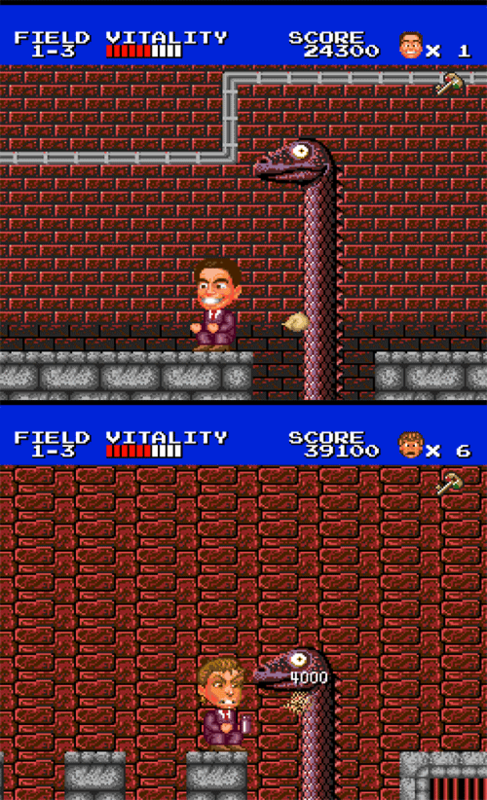 The characters can jump, and use a kick to defeat enemies and uncover secrets and hidden items. and the fact that the character you didn't pick will show up in-game to both give you hints and get in your way. Obviously, the game title and character faces have been changed. Interestingly, this is the only place in the Japanese version where the title appears in Romaji. The fonts for the American and Japanese titles are completely different, but the "&" was actually re-used, just re-colored. On a side note, it looks like the American title's font is Babylon Industrial, which I used for the logo for my music label, haha. 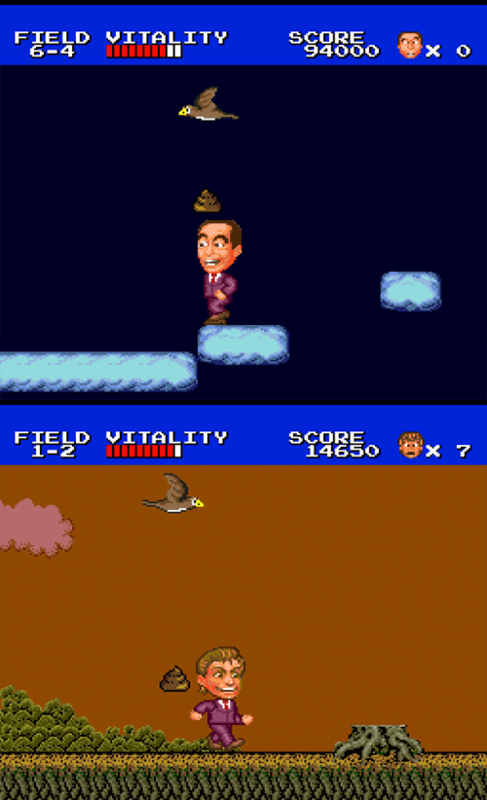 In the lower half, "HISCORE" has become "HIGH SCORE". Both were pretty common back in the day, but "high score" is definitely a little more accurate language-wise. 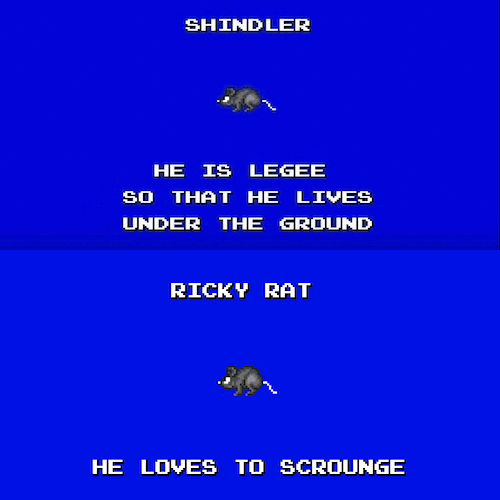 The American version also adds a credit for NEC for whatever reason. The copyright year being three years later is just a result of the hardware itself taking that long to make it to the US. Lastly, and it's not something you'd normally notice, but some of the buildings in the background differ slightly between the two versions. You can see it easily if you look at the roof area of the first building from the left. It seems like it might be a result of the title graphic being changed, but some building areas nowhere near the title are different too, so who knows. Yes, this is the J.J. and Jeff Detective Agency. What's that you say??? A very rich man has been kidnapped??? ...Yes sir! I'll get on it right away. Fear not my forlorn friend. I always solve the case!" Jeff "Hey! You don't think you're going somewhere without me?! But that's not fair! You always leave me here alone. I want some fun and adventure too, ya know!" Aside from the characters themselves being different, the openings are pretty similar on the face of things. However, the font size in the American version is much smaller, allowing for much more text (quite the opposite of last time's The Goonies 2. The Japanese version simply says there was "a kidnapping", but the American version goes into detail on who exactly was kidnapped. J.J. also gets to throw in the "Fear not" bit, whereas Katō just leaves it at "I'm on the case." 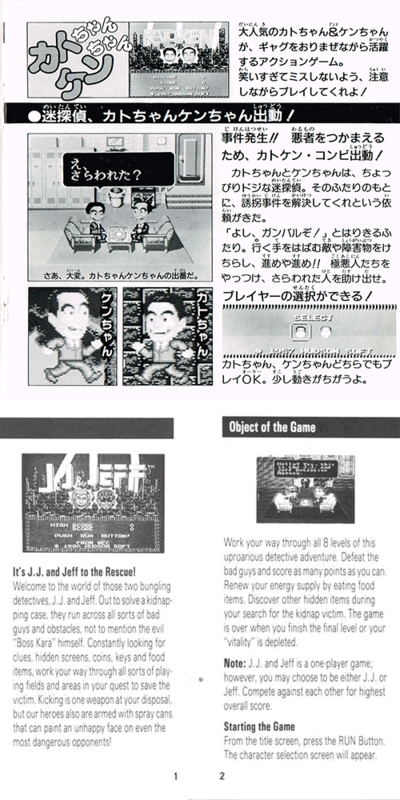 Shimura in the Japanese version is just aggravated about Katō leaving him behind (and doesn't mention "fun and adventure"), while Jeff is a bit more pitiful about it. Also, it's a small thing, but the television is blank in J.J. & Jeff, for obvious reasons. 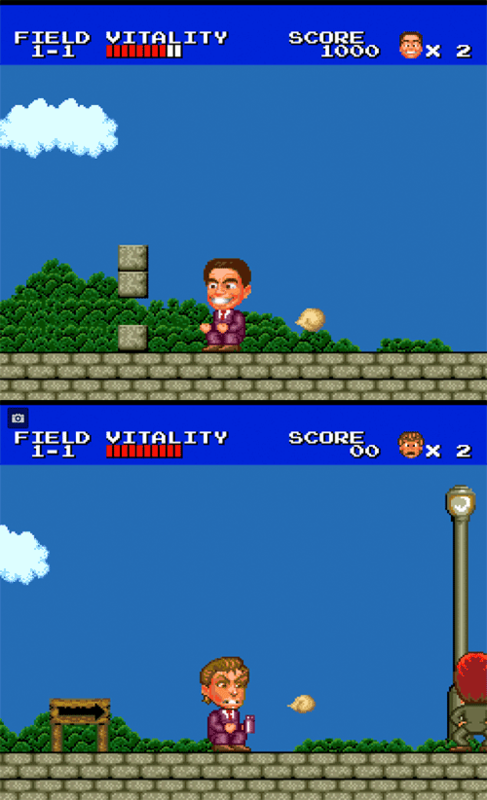 In the Japanese version, by pressing Down you can attack behind you with a fart. Apparently this was too immature for the American version, as it was changed to some kind of spray can. On top of that, the spray can is of course used in front of you rather than behind, meaning the controls are actually slightly different between the two versions. 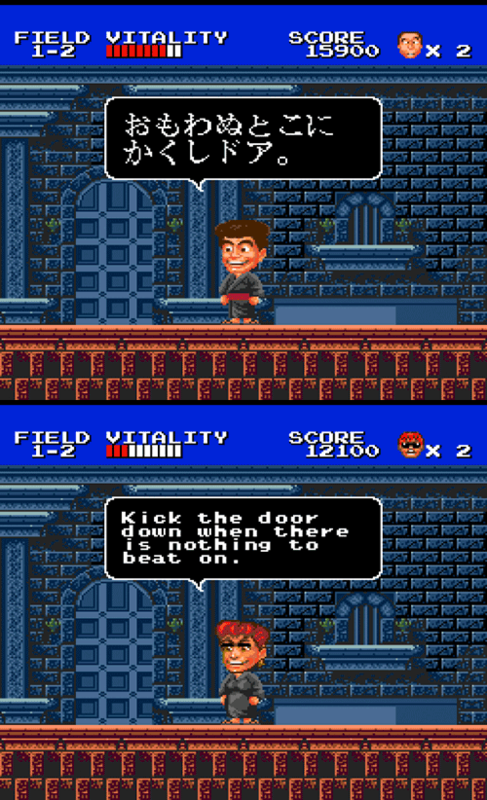 In other words, you have to turn around first if you want to use the fart attack in カトちゃんケンちゃん, but in J.J. & Jeff you don't have to worry about that (making the game a tiny bit easier in my opinion). Unsurprisingly this was also changed from the US version. 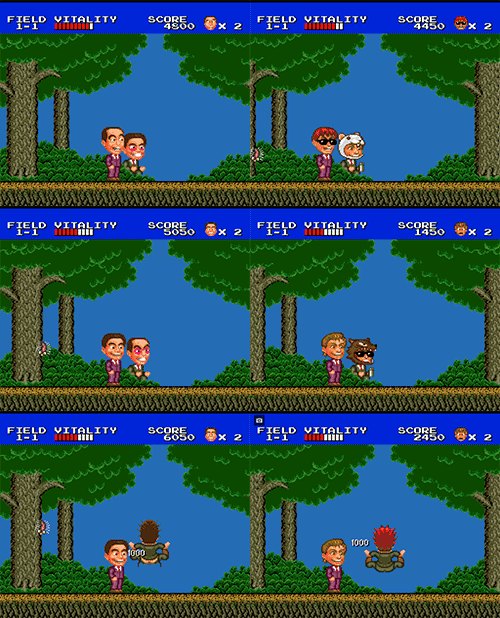 In the Japanese game you can find your partner peeing, but in J.J. & Jeff, he's just standing there (though most people can probably tell what was originally going on). The sprite after you attack them is also changed - no fly down/visible underpants for the American version. Yeah, the pooping-in-the-woods gag had to go too. In this case though, they at least made it an interesting change, though I don't know exactly what the character is meant to be doing with an animal hood and a spray can. And of course there's no buttcrack shot for the post-attack sprite this time either. 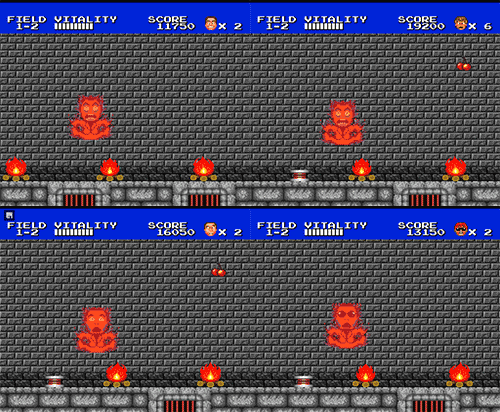 I noticed this myself while playing, but take a look at the sprites for when you die by touching fire. J.J.'s is exactly the same as Katō's, and Jeff's is just Shimura's with some sunglasses slapped on. All the other sprites are totally redrawn, which makes me wonder why they just left these as-is. 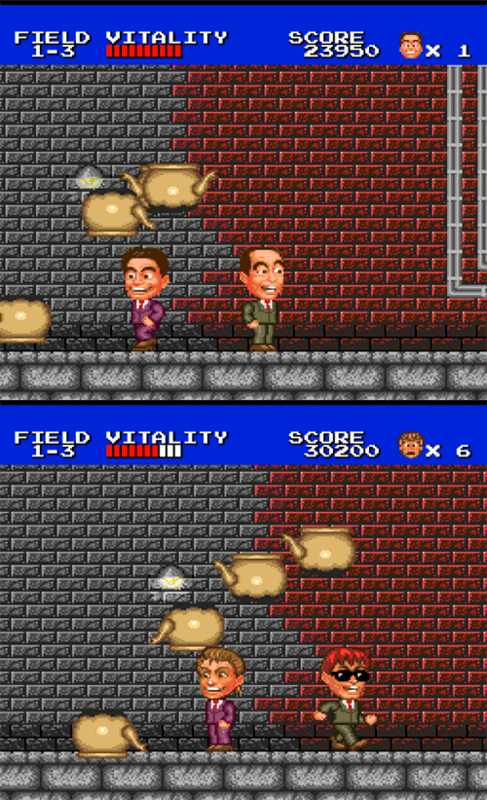 The kettles-falling-from-the-sky gag is the same in both game, which in itself is interesting. 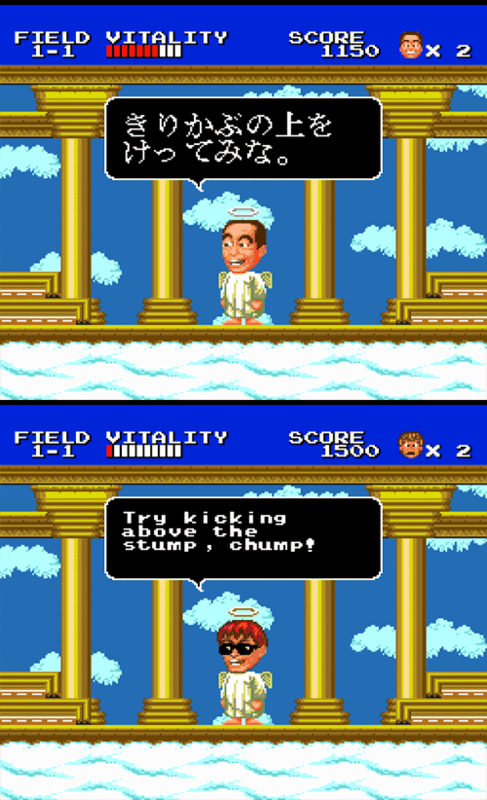 Slapstick is of course popular in both the US and Japan, but the kettle thing is very specifically Japanese, so it might've looked a little odd to non-Japanese players. but the US version just uses their regular face, which is a bit of a letdown. So someone pooping in the bushes is a no-no, but actual poop is totally fine? I'm guessing it made it past the censors because it comes from a bird rather than a human. In-game you can enter doors or ride fountains into the sky to get hints and messages from your partner. There's way too many of these screens to look at all of them, but let's at least go through the first world's worth. The Japanese hint is very straightforward: "There's hammer gongs (i.e. hit the hammer/ring the bell game) in the lampposts and palm trees." The English version is a lot more abstract, making it sound more like there're animals or something in them. Both will definitely make the player try kicking those objects, but the US version doesn't do much to say what will happen when you do. Despite this bit coming from a very Japanese joke, it's pretty much presented as-is in English. hit it three more times then make some weird noises, and this would solve all their problems. The English version here isn't exactly like that, but it's the same general vibe, even going so far as to end with a "Wonk! Wonk! Wonk!". Not being familiar with the original joke probably left most people wondering what the whole hand-drum thing was about, haha. 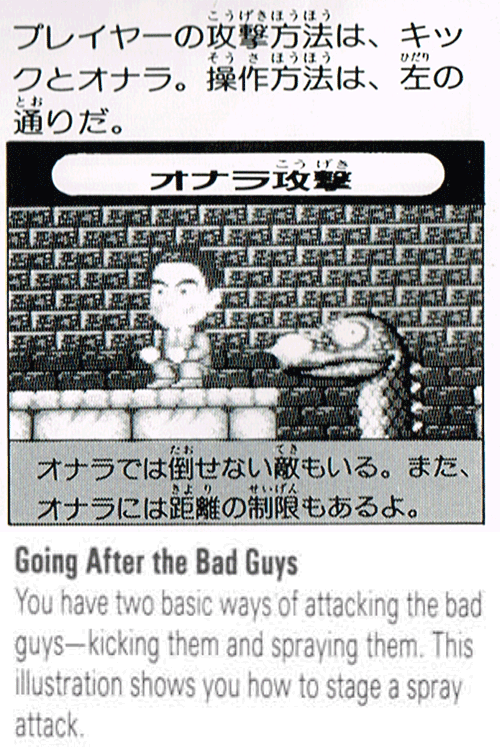 This is a really great translation - meaning is exactly the same, and the "chump" bit give it a similar feeling to the casual/slightly condescending "けってみな" of the original Japanese. First off, the costume is completely changed here. In the Japanese version Shimura is supposed to be a 殿 (tono), a type of feudal lord. Obviously that won't really come across well as-is, but I have no idea what they were going for here with the new costume. He's got a cloak, bat-like wings, and a pointed tail, but I've got no idea if he's supposed to be like a goblin or a demon or what. 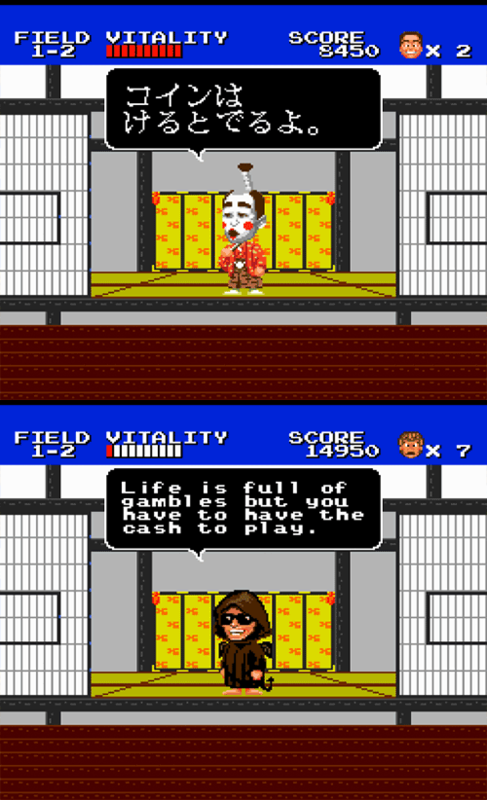 whereas the Japanese just straight-up says "You can get coins if you kick stuff." Go figure. This one's pretty much the same, but the US version has some extra text space to work with so they embellished it with the "fun and excitement" bit. They took advantage of the extra space here, too. 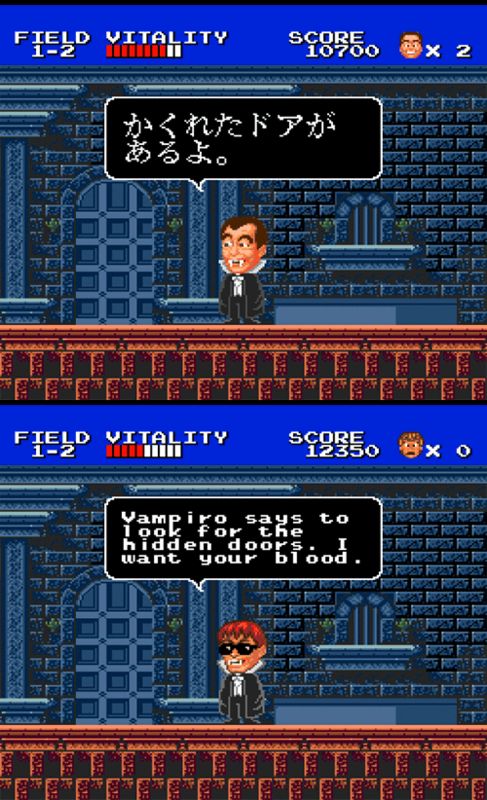 The Japanese version doesn't have the line about blood, and it doesn't have Shimura call himself "Vampiro". I can understand changing the clothing from a yutaka, since that's not exactly a common garment in the US, but why change it to cross-dressing? That shows up a fair bit in British (and Japanese) comedy, but not so much in the US so it seems like a strange choice. The message itself is also more vague in the English version again - the Japanese just says "There's hidden doors where you wouldn't expect." First they change a yutaka outfit to a crossdressing outfit, and now they change an old lady costume to a yutaka! I don't know what to think anymore. I also have no idea why the English hint is what it is, seeing as how the Japanese is "Hey, go find the key!" I almost wonder if they didn't accidentally put a string here that was meant for somewhere else. 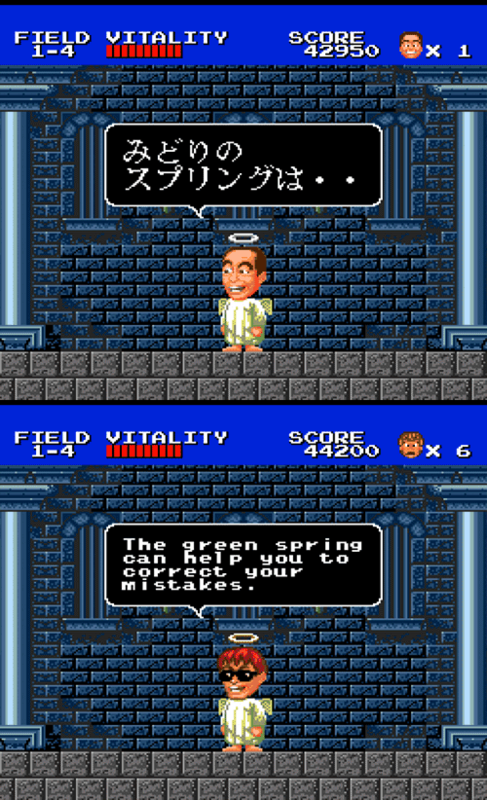 The Japanese is a pretty useless hint: "The green spring is...". The English is a little better, at least giving you a vague idea of whether you should use the spring or not. Oh hey, the weird hooded dude is back. 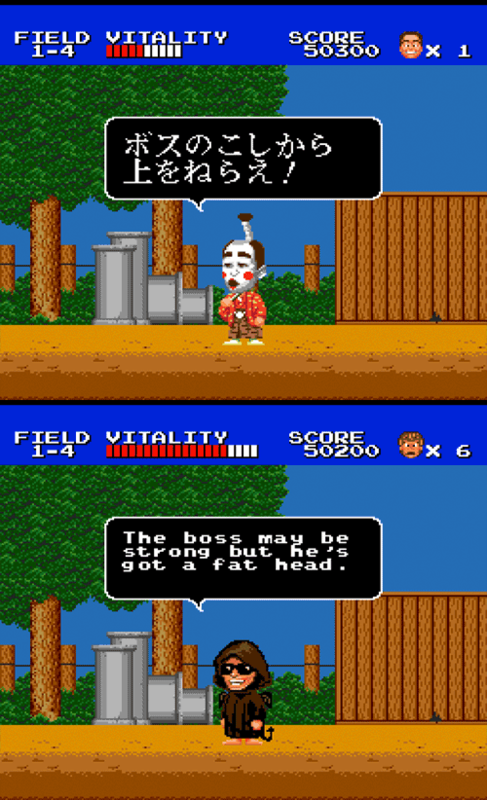 The English hint is yet again more vague, and also less detailed: the Japanese version says "Come from behind and aim for the boss's head!" In general, if you're not familiar with the source material it might seem a bit strange that your so-called partner is throwing garbage at you and giving you cryptic hints dressed in weird costumes. I suppose the best way to try to deal with that would be to somehow make it more clear in-game that it's based on a comedy show, since it was originally designed for people who were already aware of that fact. 加藤と志村「やったー！やったー！」 Millionaire "J.J., Jeff! You have rescued me! How can I ever thank you?! You want all my money? OK! You can have everything! Wa Wa Wa!" J.J. & Jeff "We did it! We did it! We did it!" he just offers up the money himself (and it's definitely not implied to be ALL of his money). After the ending there's a cast roll of all the game's enemies. Plus, for whatever reason, they all have (bad) English descriptions in the Japanese version, which were cleaned up for the US release. There's a ton of them so I won't list them all out, but here's a few of the more interesting ones. Poopatross is a great name. I'm not sure if Barbird (バーバード) has some kind of wordplay going on, it might just be a cute name. It's also impressive that they fixed the Japanese description with such small changes. I can't imagine Shindler (シンドラ) is supposed to have anything to do with that Schindler; my guess is it's actually a reference to Cinderella (シンデレラ in Japanese). "Legee" also had me stumped for a bit, but I think it's meant to be "lazy", which could feasibly be written as レージー and then romanized into "legee". 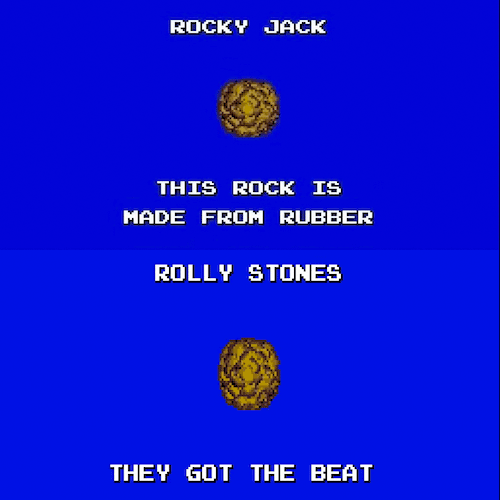 The rock being rubber is probably a joke about rubber rocks from the TV show. The joke obviously won't work as-is in English, but they get a nice Rolling Stones pun in instead. 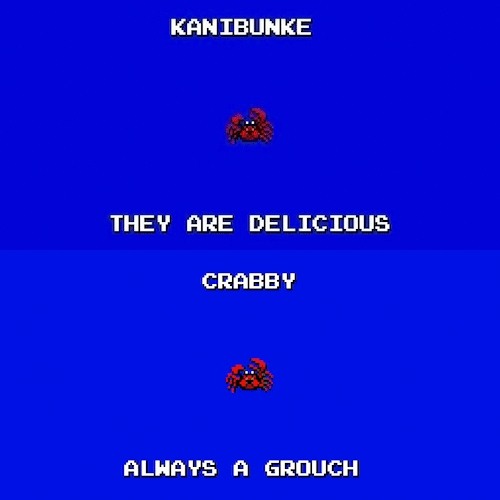 "Kanibunke" basically means "crab clan"; crab certainly is delicious but personally I like the wordplay in English a little better. "Unibow" is most likely a combination of ウニ (uni, "sea urchin") and 坊 (bou, basically a suffix meaning "little boy"). It's very similar to クリボー, the Japanese name for Mario's Goombas. 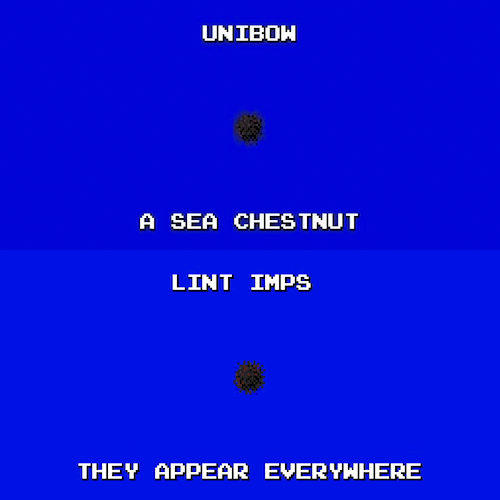 Why they made such a huge change to "lint imps" escapes me, especially since "urchin" already has multiple meanings in English. Since it's a "little" tornado, I'd bet that the Japanese name is a play on 足りない (tarinai, "lacking"). 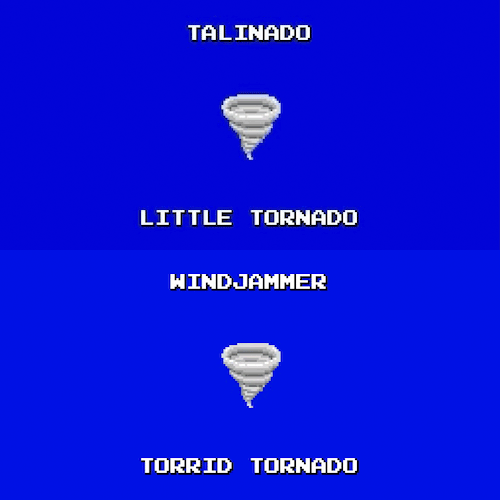 Windjammer is a nice name, and "torrid tornado" does sound great, but would "Tynado" not have been just as good? "Hero" probably isn't the English word hero, but rather just referring to helicopters (ヘリコプター). 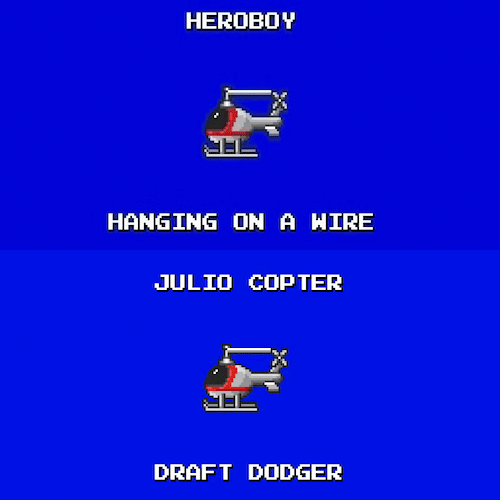 I didn't get what "Julio Copter" was supposed to mean at first, but then I said it out loud. Try it. "Draft dodger" is another really great pun, though maybe a little too high-level for younger kids. I left out the image, but the big version of this guy is called Nessy in the US version. Makes sense. 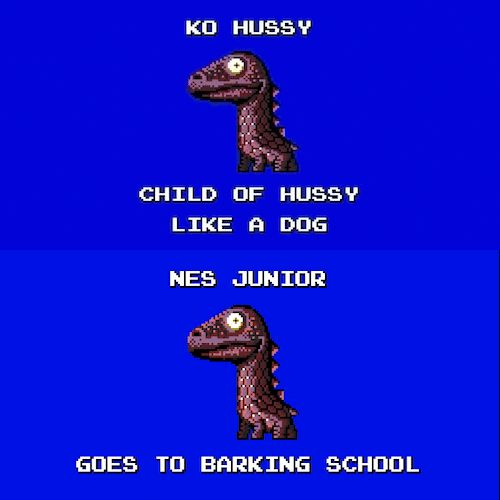 So why isn't this little dude "Ness Junior"? The only thing "Nes" makes me think of is, y'know, a competitor's product. but since that description itself isn't actually in the US version it sounds a bit odd. The Japanese names are pretty odd and seem haphazardly chosen. The US version, on the other hand, seems to have taken "Double Header" as an inspiration and came up with a nice naming pattern for the bosses. Incidentally, the bosses themselves are the exact same between the Japan and US versions, as are all the enemies. Of course they're going to be different; no specific comments but I wanted to include them with everything else. but the story detailed in the manual is totally different between the two versions as well. whereas the US version is relatively more serious. It does call it an "uproarious detective adventure" at one point, but that's as whimsical as it gets. Actually, the "story" in the English manual is pretty sparse, most of it being more about the gameplay. The Japanese is a fair bit more verbose, giving some background to the characters and their personalities. 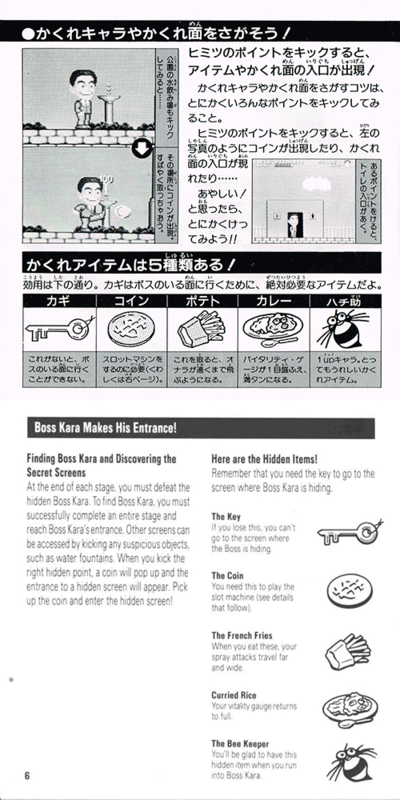 One interesting thing is the English manual makes repeated references to "Boss Kara". I'm pretty positive this is a straight-up mistranslation of "ボスキャラ" (bosu kyara, which just means "boss character"). mentioning that they control differently rather than suggesting a high score competition. 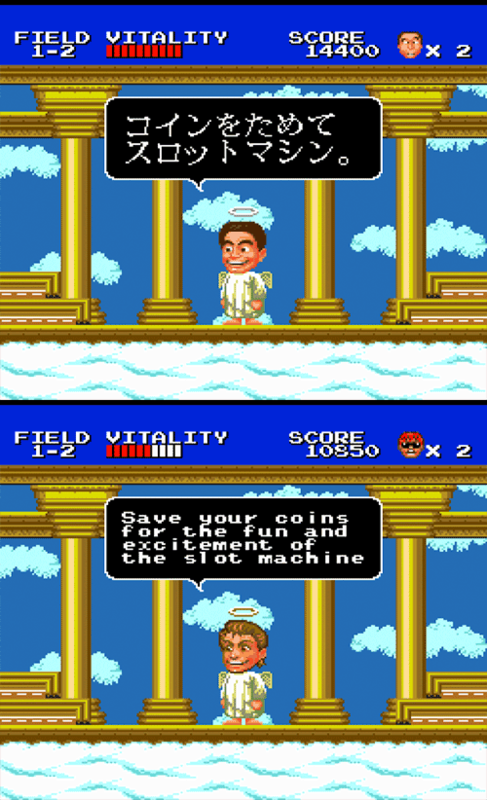 They're pretty much the same, but the English version neglects to mention that holding the Up key can increase your jump height. Both get the basic idea of food restoring your vitality down, but the English manual makes a few odd mistakes. For one, it says that food also raises your attack power, which simply isn't true, there's no way to do so in the game. It also mentions "shops", but the only place to use your coins is slot machines, not shops. 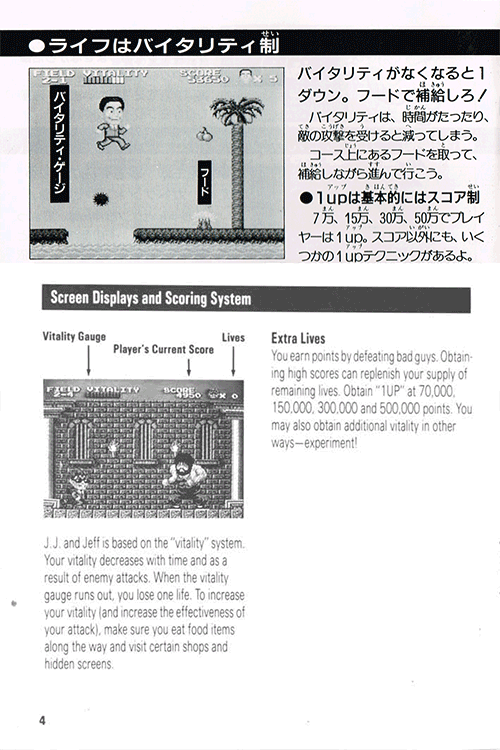 Finally, in the 1up section, the bit that says "you may also obtain additional vitality in other ways" should rather be about 1ups as it is in the Japanese manual. There's also none of the descriptive text that accompanies said illustration, so really all the English manual has to say about the spray attack is "it exists"! 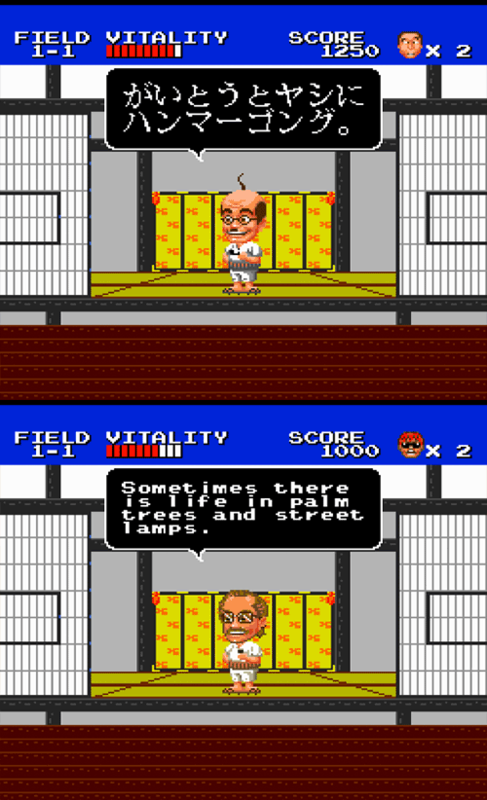 "8 different stages and a total of 32 playing areas" is a bald-faced lie and I have no idea where it comes from. The Japanese manual gets it correct (6 stages/24 areas). 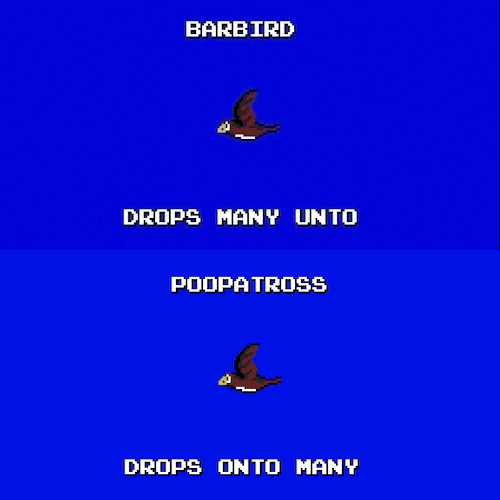 The enemies section is pretty on-point, though for some reason it's "Poopbatross" here rather than "Poopatross". Oh, "Boss Kara" shows up again, too. 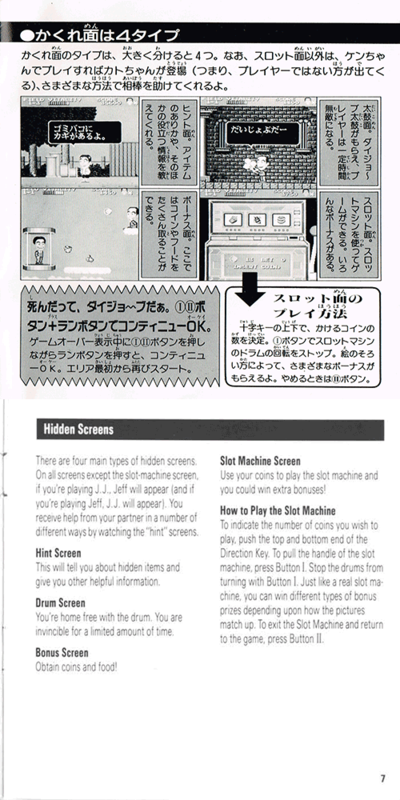 "A coin will pop up and the entrance to a hidden screen will appear" is a mistranslation - the Japanese manual says "coins may pop up or hidden doors may appear." Item-wise, the description for the curried rice omits the fact that it adds a point to your vitality bar in addition to refilling it. The "Bee Keeper" description is also odd, as it's just a 1up and the Japanese description doesn't mention bosses at all. Perhaps someone saw "1upキャラ" and got it confused with "ボスキャラ"? Ah, speaking of "curried rice", does anyone call it that? Maybe it was more common back when the game came out, but I hardly ever hear it referred to that way. This page is dang near spot-on! The "drum" is actually called the "ダイジョ〜ブ太鼓" (daijoubu daiko) in Japanese, but that kinda had to be simplified. 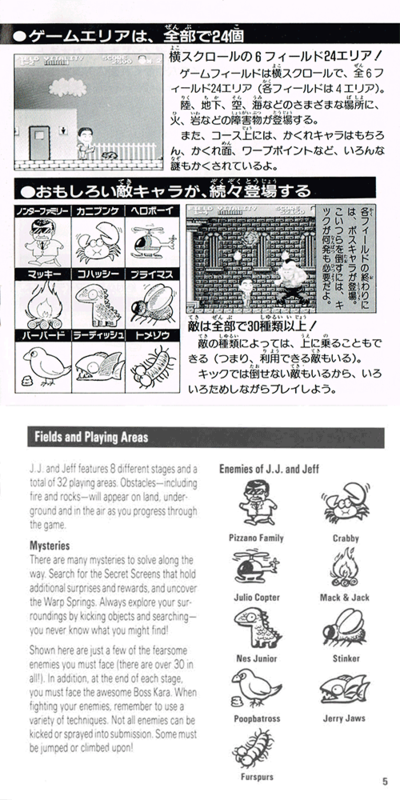 That being said, it's not limited to this page, but the English manual could really use more screenshots like the Japanese one had. I can only imagine they were trying to save on printing costs. Finally, let's take a look at the cover illustrations. As expected, they're quite different. Like many games of the era, both have a fair few things that show up in the game, as well as some that don't. 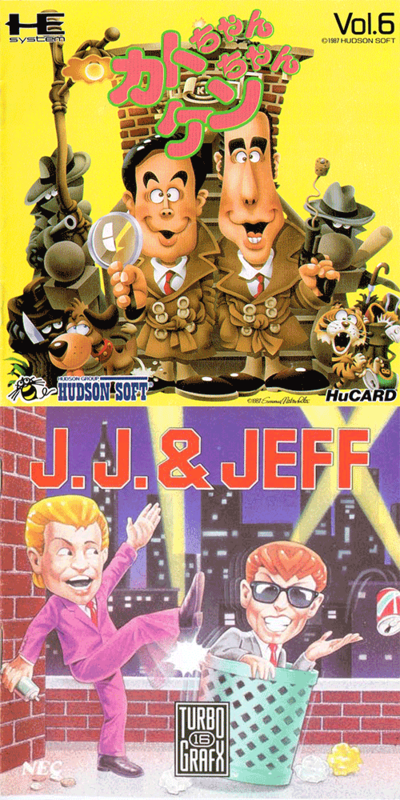 Probably the biggest thing that sticks out to me is that "J.J." and "Jeff" really don't look much like detectives - if anything, I would guess that they're talk show hosts! but there aren't any levels like that actually in the game, so it doesn't give as clear of an idea of what the game is like as it could. DieTRAX did a remix of the "Daijoubu da" skit I described earlier! It's all good! Wonk! Wonk! Wonk! 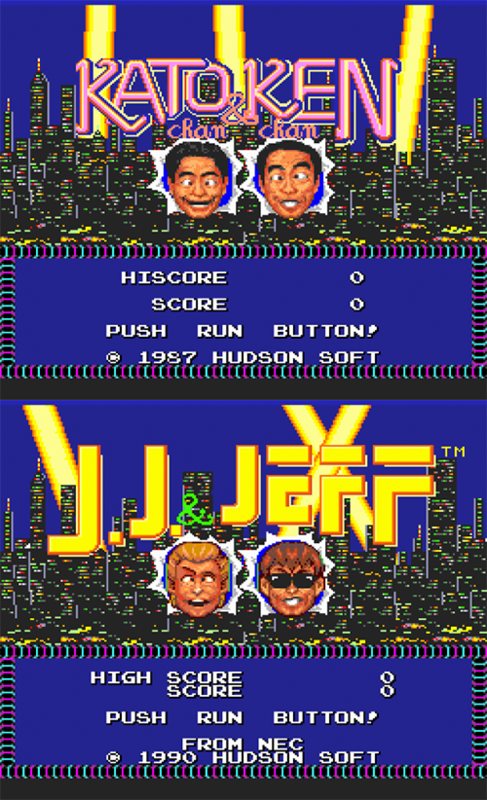 setting aside the fact that the characters had to be changed, J.J. & Jeff is actually a pretty solid localization on the whole, especially for its time. 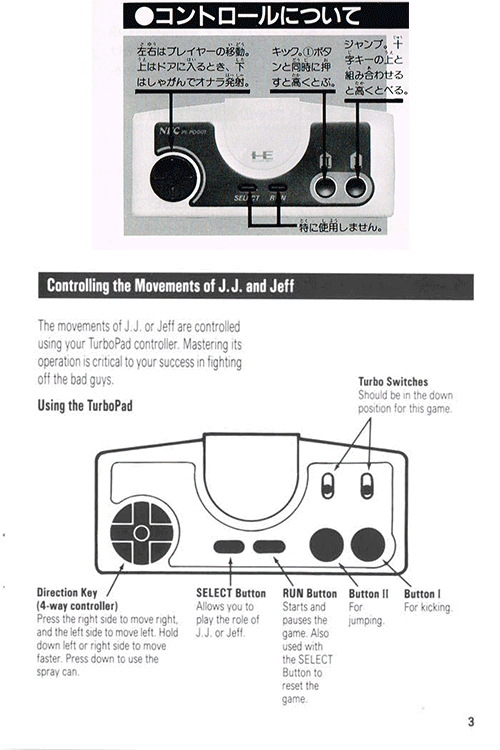 I do wish they would have been a bit more rigorous in regards to the manual, though, haha. Well, what game should I take a look at next?